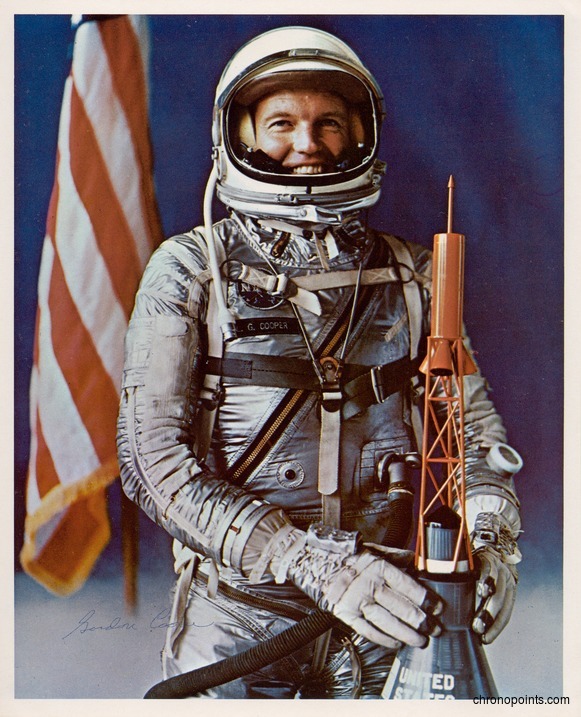 Gordon Cooper (1927-2004) was the sixth American in space and the fourth to orbit the Earth. Cooper flew in the Faith 7 spacecraft for Project Mercury. At the time, he was in space for 34 hours, longer than any American. With his second space flight in Project Gemini, Cooper led all astronauts and cosmonauts in total accumulated time in space. U.S. Air Force (USAF) Colonel Cooper was selected in 1959 as one of the Mercury 7, which was the first group of American astronauts, after a detailed examination of him physically and psychologically, and the successful achievement of the qualifying requirements. Before entering the space program, Cooper was an accomplished pilot, aeronautical engineer, and test pilot. 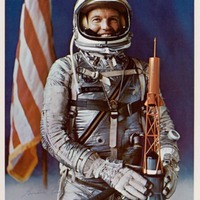 In this self signed color photograph, Cooper is posed in his space suit standing next to a scale model of his spacecraft with the American flag behind him. Original 8 x 10 inch color photographic print: Private Collection of Dr. Calvin D. Fowler. Digital reproduction of original 8 x 10 inch color photographic print. "Biographical Data: LEROY GORDON COOPER, JR. (COLONEL, USAF, RET. ), NASA ASTRONAUT (DECEASED)" Lyndon B. Johnson Space Center, National Aeronautics and Space Administration. http://www.jsc.nasa.gov/Bios/htmlbios/cooper-lg.html. “Astronaut Gordon Cooper.” RICHES of Central Florida accessed April 22, 2019, https://richesmi.cah.ucf.edu/omeka/items/show/4970.